Who are these fantastic companies? Amazon is the leader in e-commerce. Apple reinvented mobile devices and content distribution. Facebook is the largest social network in the world, a big brother in the making. 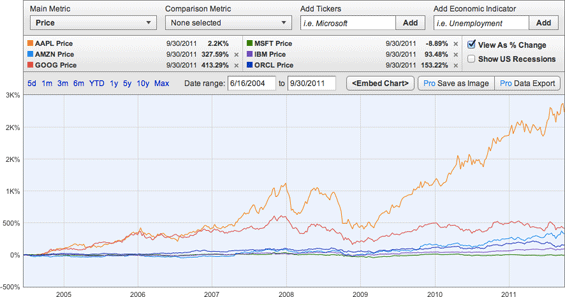 Google is the biggest web and search company. I almost won't argue with the choice of the Fab Four. 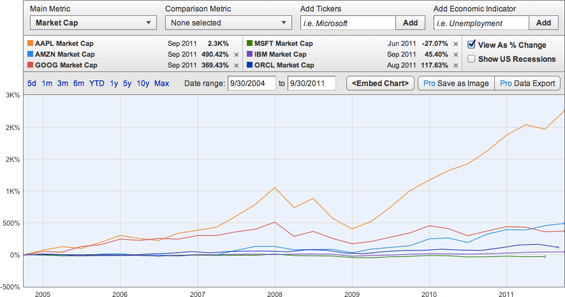 To me, these are truly the technology companies that are moving things forward. To be honest, the list is bit of an understatement for Microsoft, even though that doesn't change the fact I'm trying to put out here. 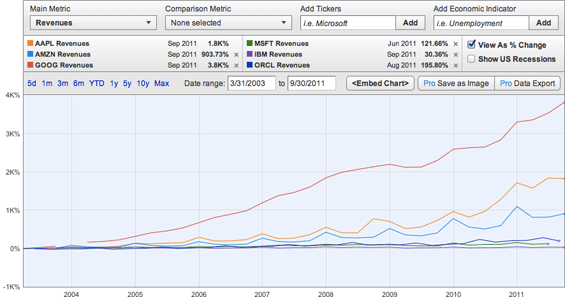 These four corporations (their software at least) are more B2C (Business To Consumer) than B2B (Business To Business) oriented. 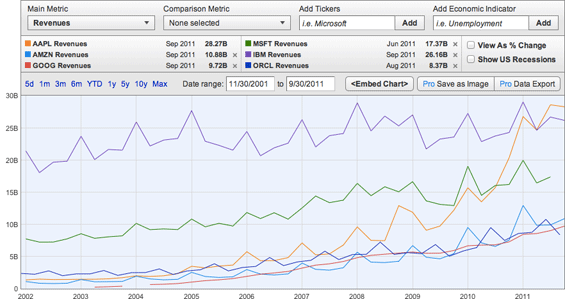 Even Microsoft, with its XBox, Bing, Windows (Phone and Tablet) programs is shifting focus to consumer markets. The B2B software market is still huge, but electronic commerce, online advertising and the economy of scale of billions of users spending a few dollars is slowly outperforming more expensive business solutions sold fewer times, even if they are deployed millions of times as operating systems, products or services. 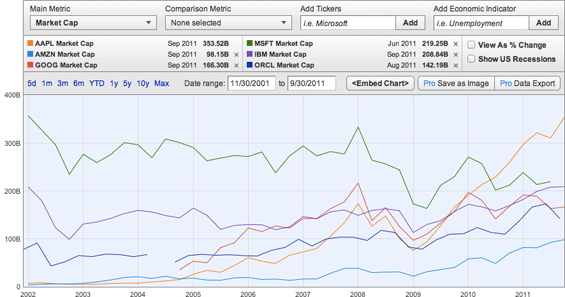 If you check out the following charts, you can see information about market capitalization, revenue and historical price change of these companies (Facebook is not public yet, but it's IPO could be around $100 billion) compared to traditional technology companies such as Oracle, Microsoft and IBM. The numbers are pretty interesting (source: ycharts). Some business software companies, such as Salesforce.com have managed to adapt to this situation, offering a platform others can upgrade and develop on. We're adapting too, on a smaller scale. Neolab is still mostly focused on B2B software, since that's where we've built our market. Sure, we did a few web portals and are working on deploying our own user-targeted service Twitfluence, but it's business-oriented software that we generally work on. But that doesn't change the fact we are fully aware that the concept of software is changing, and we are on top of it, trying to embrace these trends and include new paradigms in corporate infromation systems. Social, user-oriented, user-friendly. Knowing that people are behind every company. Software is maturing; consumers are getting more and more demanding, brands behind the software are getting more and more important. And as the Web expands even further, this fact will become yet more obvious. It's you and me who are the ones who are "buying" software. Which is great, since in the end the ordinary people, not corporations, will be those who will decide how software and technology of the future will look like. Interactive, useful and fun. Here we are now, entertain us.